The Arrhenius radiative greenhouse effect proponents, having abandoned "back-radiation" from greenhouse gases as the explanation of the greenhouse effect, now claim global warming is instead due to an increase of the "effective radiating height" or "effective radiating level" [ERL] of greenhouse gases in the atmosphere. So the theory goes, an increase of CO2 levels will cause longwave (~15 micron) infrared emissions from CO2 to occur from colder heights in the atmosphere, and since colder blackbodies emit less radiation, more radiation will allegedly be "trapped" by the colder CO2 "blackbody" in the fabled tropospheric "hot spot" & unable to escape to space. In contrast, the competing 33C gravito-thermal greenhouse effect of Maxwell, Clausius, Carnot, Boltzmann, Feynman, Poisson, Helmholtz, et al, shows that the "effective radiating level" or ERL is fixed at the center of mass (COM) of the atmosphere. 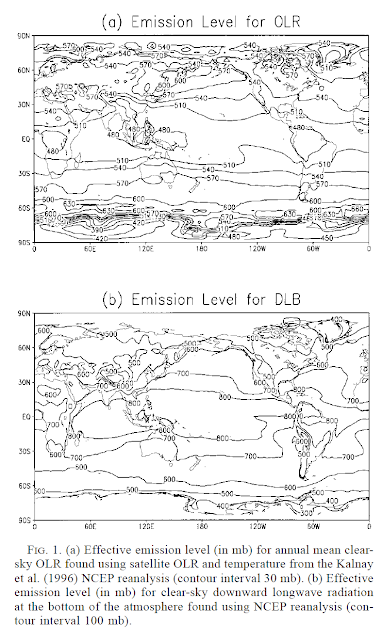 As we can see in Fig 1a, the observed ERL or "emission level for OLR (Outgoing Longwave Radiation)" global average is right around 500 millibars or 0.49 atmospheres ~ 0.5 atmospheres, exactly at the center of mass of the entire atmosphere as predicted in the HS greenhouse equation below. all of which are essentially constants in the atmosphere, and without any knowledge of the surface temperature, greenhouse gas concentrations, or Arrhenius "radiative forcing" from greenhouse gases. Why use the center of mass of the atmosphere in calculation of the gravito-thermal greenhouse effect? Because the force of gravity by Newton's Second Law is F = ma = mg, and for a system of particles like our atmosphere, one must determine the center of mass in applying Newton's 2nd Law F = mg to the force of gravity. Thus, since the height of the ERL is fixed at the COM, and the COM is essentially a constant, the height of the ERL will not change, regardless of greenhouse gas concentrations. In addition, in the longwave infrared band of Earth’s thermal radiation, the only band in which CO2 absorbs and emits is centered at ~15 microns. The kinetic temperature of the surrounding atmosphere and the CO2 molecules has nothing to do with the fact that CO2 emits at a fixed ~15 microns in the longwave IR due to its fixed molecular structure bending transitions. The entire atmosphere surface to space is warmer than the CO2 “equivalent partial blackbody” fixed band-emitting temperature of 193K at ~15 microns. Also, absorption followed by emission of a photon by CO2 only takes microseconds, and all the bouncing around at the speed of light between greenhouse gases in the atmosphere only delays the average photon a few milliseconds on its way from the surface to space. Thus, the only "slowing of cooling" or "heat trapping" by CO2 absorption/emission is a few milliseconds and easily reversed and erased over a 12 hour night. Addition of more CO2 increases the few milliseconds delay by adding a few more milliseconds, but once again is easily reversed and erased over a 12 hour night. More importantly, increased CO2 increases radiative surface area, which increases radiative loss to space. That’s why increased CO2 cools the stratosphere through thermosphere, and troposphere as well as I’ve shown. And even more importantly, the probability of CO2 transferring heat by collisions with N2/O2 in the troposphere is about 2 orders of magnitude higher than emitting a photon, which increases convective cooling. An earlier post also provides nine additional reasons why the effective radiating level (ERL) is always located at the center of mass of the atmosphere & not controlled by greenhouse gas concentrations. Thus, the false notion that global warming is instead due to an increase of the "effective radiating height" or "effective radiating level" [ERL] of greenhouse gases in the atmosphere is effectively disproven. The "Greenhouse Equation" calculates temperature (T) at any location from the surface to the top of the troposphere as a function of atmospheric mass/gravity/pressure and radiative forcing from the Sun only, and without any radiative forcing from greenhouse gases. Note the pressure (P) divided by 2 in the greenhouse equation is the pressure at the center of mass of the atmosphere (after density correction), where the temperature and height are equal to the equilibrium temperature with the Sun and ERL respectively. We will use the ideal gas law, 1st law of thermodynamics, Newton's second law of motion (F = ma), and well-known barometric formulae in this derivation to very accurately determine Earth's surface temperature, the height in the atmosphere at which the effective equilibrium temperature of Earth with the Sun is located, and show that this height is located as expected at the center of mass of the atmosphere on Earth and Titan. We will show that the mass/pressure greenhouse effect theory can also be used to accurately determine the temperatures at any height in the troposphere from the surface to the tropopause, and compute the mass/gravity/pressure greenhouse effect to be 33.15C, the same as determined from radiative climate models and the conventional radiative greenhouse effect theory. an equation of state that relates the pressure P, volume V, temperature T, number of moles n of gas and the gas law constant R = 8.3144621 J/(mol K). which by the Stefan-Boltzmann law equates to a blackbody radiating at 255 K or -18C, which we will call the effective or equilibrium temperature (Te) between the Sun and Earth. As seen by satellites, the Earth radiates at the equilibrium temperature 255K from an average height referred to as the "effective radiating level" or ERL or "effective radiating height." Newtons per square meter corresponds to the force per unit area [or "gravity forcing" upon the atmospheric mass per unit area of the Earth surface]. F = mg (4) where g is the gravitational constant 9.8 m/s2, i.e. the acceleration due to gravity in meters per second squared. thus, the weight of the atmosphere over 1 square meter of the surface is 10,500 kilograms, quite a remarkable gravitational forcing upon the atmosphere. SI units of pressure refer to N/m2 as the Pascal (Pa). There are 1.0325 x 10^5 Pa per atmosphere (unit). First let's determine the pressure at the ERL since the temperature must equal the equilibrium temperature of 255K at the ERL. We will now determine the height (h) at the ERL where the temperature = the effective equilibrium temperature = 255K, and without use of radiative forcing from greenhouse gases. So the height of the ERL set by gravity forcing is located at 5100 meters and is where T=Te=255K and pressure = 0.5 atmospheres, right at the center of mass of the atmosphere as we predicted from our gravity forcing hypothesis. is also completely independent of any radiative forcing from greenhouse gases, greenhouse gas concentrations, emission/absorption spectra from greenhouse gases, etc., and is solely a function of gravity and heat capacity of the atmosphere. which is exactly the same as determined by satellite observations and is 33.15C above the equilibrium temperature -18C or 255K with the Sun as expected. Thus, we have determined the entire 33.15C greenhouse effect, the surface temperature, and the temperature of the troposphere at any height, and the height at which the equilibrium temperature with the Sun occurs at the ERL entirely on the basis of the Newton's 2nd law of motion, the 1st law of thermodynamics, and the ideal gas law, without use of radiative forcing from greenhouse gases, nor the concentrations of greenhouse gases, nor the emission/absorption spectra of greenhouse gases at any point in this derivation, demonstrating that the entire 33C greenhouse effect is dependent upon atmospheric mass/pressure/gravity, rather than radiative forcing from greenhouse gases. Also note, it is absolutely impossible for the conventional radiative theory of the greenhouse effect to also be correct, since if that was the case, the Earth's greenhouse effect would be at least double (66C+ rather than 33C). In essence, the radiative theory of the greenhouse effect confuses cause and effect. As we have shown, temperature is a function of pressure, and absorption/emission of IR from greenhouse gases is a function of temperature. The radiative theory tries to turn that around to claim IR emission from greenhouse gases controls the temperature, the heights of the ERL and tropopause, and thus the lapse rate, pressure, gravity, and heat capacity of the atmosphere, which is absurd and clearly disproven by basic thermodynamics and observations. The radiative greenhouse theory also makes the absurd assumption a cold body can make a hot body hotter,disproven by Pictet's experiment 214 years ago, the 1st and 2nd laws of thermodynamics, the principle of maximum entropy production, Planck's law, the Pauli exclusion principle, and quantum mechanics. There is one and only one greenhouse effect theory compatible with all of these basic physical laws and millions of observations. Can you guess which one it is? It does seem clear to me that for an atmosphere suspended off a surface against the force of gravity in hydrostatic balance the average effective radiating height would be at the centre of mass. However, there are many varied atmospheric constituents that have radiative capability and there is no reason why each should not have its own discrete effective radiating height. Nonetheless, if an atmosphere is to be retained the average effective radiating height must be at the centre of mass. That implies that if one atmospheric constituent changes in quantity then any change in its effective radiating height must be offset by an equal and opposite change in the effective radiating height of one or more of the other atmospheric constituents. In my humble opinion any radiative capability off the surface must reduce surface radiation to space so that any changes in the radiative capability of atmospheric constituents simply swap thermal effects between themselves or with the surface to retain atmospheric equilibrium. The result is that surface temperatures below atmospheres and the average temperature at every height off the surface can be calculated simply by reference to top of atmosphere insolation and surface atmospheric pressure caused by atmospheric mass subjected to the force of gravity. That seems to accord with observation of the various planetary atmospheres that have been investigated to date. "The result is that surface temperatures below atmospheres and the average temperature at every height off the surface can be calculated simply by reference to top of atmosphere insolation and surface atmospheric pressure caused by atmospheric mass subjected to the force of gravity. That seems to accord with observation of the various planetary atmospheres that have been investigated to date." Yes agreed, and we're already up to the only 8 rocky planets in the solar system that have sufficient data to prove that hypothesis! In contrast, the Arrhenius GHE theory fails miserably in trying to explain the GHE on Earth, Mars, and Venus! On reflection I’m not so sure of the centre of mass aspect. If there is no radiative capability in an atmosphere the radiation to space all comes from the surface yet the atmosphere remains in hydrostatic balance. Earth’s surface would still be at 288K and 255K would still get out to space but it would all be coming from the surface so the effective radiating height would be the surface and not the centre of mass. I think the answer lies in separating the effective radiating height from the processes of conduction and convection such that the mass of the atmosphere is supported by conduction and convection with only the surplus radiating out. Radiative capability within an atmosphere does raise the effective radiating height off the surface proportionately to the radiative efficiency of the atmosphere but appears to be unrelated to the centre of mass. Convection would then be the process that reconciles any thermal imbalance arising as a result of the effective radiating height moving up from the surface. Could it be that convection adjusts as necessary to arrange that the temperature at which radiation is emitted to space is found at the centre of mass regardless of where that radiation actually departs from ? The 255K "ERL" is located near the center of the 68K tropospheric temperature gradient at the center of mass. From the 255K ERL to surface there is a 33K "enhancement" and from the ERL to tropopause an even larger -35K anti-greenhouse effect. All the gravito-thermal effect does is re-distribute the heat from the Sun more toward the surface and less to the upper troposphere in comparison to the 255K ERL. The "ERL" is just an "average" emitting level. If you look at the OLR spectra you'll see the linear lapse rate temperatures line up perfectly with the spectra, indicating the Arrhenius believers have confused the cause with the effect. I think we can clarify the matter by refining the terminology. There is an average emitting level found by combining all the actual emitting levels. There is an effective emitting level where the atmosphere is at the temperature required to achieve observed radiation to space. For Earth that temperature is 255K and the effective emitting level as so defined is found at the centre of mass. "There is an effective emitting level where the atmosphere is at the temperature required to achieve observed radiation to space. For Earth that temperature is 255K and the effective emitting level as so defined is found at the centre of mass." All true, but more importantly the 255K ERL is the equilibrium temperature of the Earth with the Sun, thus energy is conserved Confirmed by satellite observations, the blackbody temperature of Earth seen from space is 255K, exactly the same as the the equilibrium temperature of Earth with the Sun as calculated by the S-B Law. When the atmosphere first rose off the ground then (assuming current mass, gravity and insolation) the Earth's temperature viewed from space would have appeared to be 222K but only during the progress of the first convective overturning cycle. During that first cycle kinetic energy at the surface was diverted to convective overturning via conduction and was therefore not capable of being radiated to space at the same time. Once the first convective overturning cycle completed then the Earth's temperature as viewed from space returned to 255K as per S-B because the kinetic energy being taken up was then simultaneously being returned to the surface. Forever afterwards that same 33K of kinetic energy has been locked into the convective overturning cycle and will remain there for so long as the atmosphere remains suspended off the surface against the constant force of gravity. Even an 8 year old should be able to grasp such simple concepts. "Even an 8 year old should be able to grasp such simple concepts." Yes, as Feynman said, if you can't do that, then you really don't understand the science. The proof is that OLWR has been increasing for the past 15 years as CO2 allows the globe to cool. OLR increasing not only 15 years, but the past 62+ years. Falsifies AGW. Take this hypothesis to an extreme case, Venus. Looks to me like radiative equilibrium with space to that atmosphere is far above median mass. Venus is a unique case since >90% of solar insolation is absorbed in the nearly opaque cloud layer at the TOA. Direct absorption of incoming solar energy by a layer off the surface of any planet does seek to break the rule but any consequent distortion of the lapse rate slope has to be negated elsewhere in the convective system by distorting the lapse rate slope in an equal and opposite direction. The stratosphere on Earth is similar but the distortion of the lapse rate slope by ozone's capacity for absorbing incoming solar energy in the stratosphere is then reversed in our mesosphere. Note the definition of 'effective' radiating height. It need not be the same as 'actual' radiating height. It can be higher or lower than the point at which radiation is actually sent out to space. Is there a region within the vertical atmospheric column of Venus where the effect of absorption by the clouds at TOA is negated ? You don’t refer to CO2 but your physics is standard climate science and wrong. I agree with 1 and 2. The Barometric Equation is derived and is wrong in theory and does not work in practice. What you do here is associate conservation of energy which is not controversial with IGL which is. You introduce ERL, average effective emission level, not physical. The atmosphere emits at all levels. The purpose of this is to convince (yourself?) that gravity is causing weight. You say “the weight of the atmosphere over 1 square meter of the surface is 10,500 kilograms”. This is not correct. 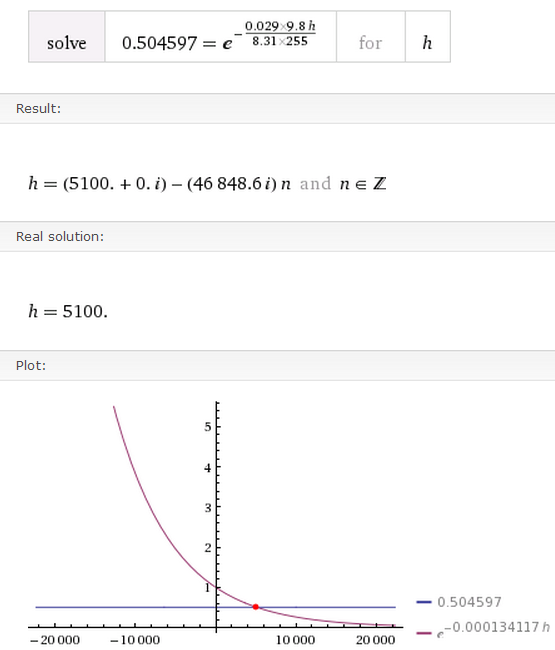 You have calculated the mass over 1 m^2 of surface. This calculation was first made by Pascal in 1648.He can be excused but you know weight is not mass. Gas molecules do not cause weight because they are moving. P(h) = ρgh (7) I don’t accept. Air pressure is not caused by weight. Pressure is in all directions, weight is only down. Why introduce an infinitesimal? No need, not justified. My suspicion is that knowing pressure falls in an exponential curve the differential is introduced so we can later integrate and get the curve we as looking for. Do you have a better explanation? BE is derived for isothermal T.
It is not then possible to let T vary. US Standard Atmosphere calculator does not use the BE you derived. I got this from one of your posts. Page 4 section B.1 the exponential pressure gradient is derived using velocity and gravity, not mass and gravity. We have known since Bernoulli, 1738 that pressure is caused by mv not mg. Your analysis does not mention molecular velocity. "You don’t refer to CO2 but your physics is standard climate science and wrong." Of course it's standard meteorology known since the 1800's, but is actually CORRECT, not "wrong"
I have created lots of strawmen, the opposite of what I've said, and then shot down YOUR strawmen. IDL obviously only applies to LOCAL THERMODYNAMIC EQUILIBRIUM along EACH ISOTHERM, which is obviously DIFFERENT AT EACH GEOPOTENTIAL HEIGHT. "Gas molecules do not cause weight because they are moving." The MASS of air ABOVE each geopotential height is that of the MASS of the remaining atmosphere ABOVE that geopotential height. I'm sorry, but your reply is just too ignorant to waste further time upon. All of this is explained time and again in all the GHE posts and Feynman posts, etc. etc. Please read all of those first before wrongly claiming I'm wrong, and ask yourself the question, how does my HS GH equation perfectly reproduce the troposphere on Earth and Titan without any GHGs or radiative forcing other than from the Sun, not GHGs? I have found your criticism of the theory that CO2 causes the GHE to be well written and convincing. You also helpfully list many other theories of the amount and cause of the GHE, among them your own. I am asking you to also be critical of your own explanation of the pressure and temperature gradients of the atmosphere. I appreciate your response. You have used “obviously” twice and the rest in capitals, which is shouting. This shows you are not convinced by your own arguments. The Gas Laws, Boyles Law and Charles Law apply to mass of gas with a single pressure, a single temperature and a fixed volume. The atmosphere does not have these properties. The Gas Laws do not apply. However the Kinetic Theory of Gas (Bernoulli, 1738) and Statistical Mechanics can be applied to any mass of gas in thermal equilibrium, such as the atmosphere. There are not a series of local thermal equilibriums at different heights. There is equilibrium for the whole atmosphere, at least up to the tropopause at 20km. The measured pressure/h is a single continuous smooth curve. "Gas molecules do not cause weight because they are moving." The MASS of air ABOVE each geopotential height is that of the MASS of the remaining atmosphere ABOVE that geopotential height. I know there are many tons, mass, above my head. But there is no weight. Solids and liquids cause weight, gasses do not. pv =mgh The hydrostatic equation for solid and liquid not gasses. Gas molecules in a gravity field causes the velocity of molecules to change, gravity cannot cause gas to exert weight. I have read Feynman, I disagree with Feynman. how does my HS GH equation perfectly reproduce the troposphere on Earth and Titan without any GHGs or radiative forcing other than from the Sun, not GHGs? "I have read Feynman, I disagree with Feyman"
That pretty much says it all, and you're arguments are nonsensical. This will thus be the end of this conversation from my side. Typo, should obviously read "your arguments are nonsensical." The funny thing is that your theory actually depends on greenhouse gases (GHG). If you would have an atmosphere of pure N2 then only the surface can radiate long wave infrared (IR) or microwave radiation. The N2 molecule lacks an internal dipole moment, hence it can not emit or absorb IR or microwave radiation since by fundamental physical laws a fluctuating dipole moment is required for interactions with or emission of photons. It could still emit very high energy light if it was electronically excited I guess but that requires very high temperatures. Green-house gases have the common characteristic of having internal dipole moments (note, it is not a requirement that the molecule has an overall polarity, cf. CO2) so they can absorb or emit low energy photons. These things are explained in fundamental physical chemistry text books like Atkins Physical Chemistry. So, for a planet with an atmosphere consisting of only N2 the surface is the only place from which radiation can be emitted at temperatures applicable to planets like earth, because the surface is on the contrary full of molecules or materials with internal dipole moments. If N2 was the only gas in earth's atmosphere the surface temperature would have to be the same as that calculated for it without an atmosphere, i.e. 255 K. No gravito-thermal green-house effect then exists, even though the atmosphere has a mass. There would also still be convection due to differential heating at the equator vs. the poles. It thus turns out that your gravito-thermal GHE is actually dependent on GHGs. Isn't that ironic. The gravito-thermal effect is not dependent upon presence of GHGs. I have an upcoming post (as well as prior posts) explaining why a Boltzmann distribution of a pure N2 Earth atmosphere would have a higher surface temperature than the present atmosphere (i.e. GHGs help COOL the atmosphere). Please see these posts (& Feynman) and check back for my upcoming post that clearly proves this using the lapse rate formula alone. Do you know that nitrogen gas, i.e. Dinitrogen or N2 molecules, can not absorb or emit long wave radiation such as visible, infrared or microwave light in it's electronic ground state? This is an experimentally proven fact and well established theoretically. I am sure you are aware of it, right? The Effective Radiative Level (ERL) must therefore by necessity be at the surface for a planet with an atmosphere containing only N2, or any other non-Green-house gas. This is completely independent of the distribution of the gas molecules. It is impossible to radiate energy from higher altitudes in such systems so all energy exchange that occurs between the planet and it's surrounding (sun and space) takes place at the surface. The temperature at the surface then has to be 255 K as determined by the energy balance set by incoming solar energy and outgoing emitted radiation. Martin, I'm not avoiding replying on anything. I've already said on this blog a million times N2 and O2 are not IR active gases. It is true the ERL height has to be zero in a pure N2 atmosphere. 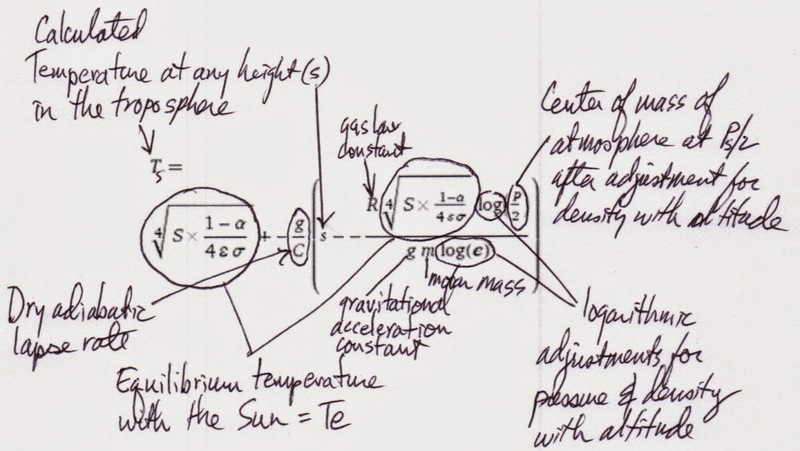 However the equilibrium T with Sun is still fixed at the center of mass & kinetic temperature at the point is 255K. My upcoming post will show that the surface T in an earth pure N2 atmosphere would be 25C warmer than the present Ts due to the steeper lapse rate. Luke you are definitely on the same tracks that I took the only thing you now need is the assumption that gravity and gravitational potential energy must be in continual local and total thermodynamic equilibrium at every point in the atmosphere With "real" or kinetic energy. That's why the lapse rate is simply the ratio of gravitational "-" potential energy (PE)/Cp the great problem of people understanding this simple fact is the pay and did not assume the entire atmosphere always must be inperfect equilibrium with gravity! Therefore both dynamic and kinematic viscosities of the entire kinematic + gravitational PE atmosphere must be always in local + total thermodynamic equilibrium at every point in time and space. Game over for not just 99% of CO2 alarm, but 100%. I can't go into the details yet but I have a very very big news about a breakthrough on this issue I think. Regards, and thanks for your interest. Let me know how you are doing and if you have any other questions, thank you. Would you be interested in posting your derivation as a guest post?